I hate it when there starts a hidden process in the background, your hdd’s start spinning and rumbling and you don’t know whats happening. That doesn’t only happen in Linux (amarok http cache cleaner) or in Windows. This time it is Mac OS X and the funny thing is that one hidden process always crashed my system once or twice a day. Thats it, save and reboot. Funny thing is that Qumana crashed like 3 times while writing this post. I guess their spell check is still buggy. Ok, the most wierd crash is on sudo periodic weekly . I figured out that the command /usr/libexec/locate.updatedb crashes my system. The first fix was to disable it in the weekly.500 . I hope somebody can tell me why the database building for the locate command crashes on my system … My first guess is that i have too much hdd space to index and some cache is too small to hold the index while building. The last link worked. I made the locate-database-update ignore my /Volumes and now everything runs smooth. After trying so many tutorials and installing so many tools i finally made it. Front Row 1.3 is running smoothly on my 10.4.8 AMD , and no illegal hacks were needed. At first i tried this Front Row guide bei Andrew Escobar and ofcourse it was not working and ofcourse it crashed my system. 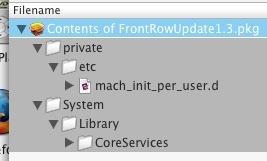 First get Front Row 1.3 from Apple’s update site and drag the FrontRowUpdate1.3.pkg from the .dmg on your Desktop. The other way is to get the Pacifist 2.0.1 open the FrontRowUpdate1.3.pkg with it to install the 2 files manually. Having this done we can proceed to the step where all my previously read tutorials failed. At first i started with some kind of fake driver, like FrontRowPass.kext from Khadgar’s blog. This didn’t work at all for me. Next i found this interesting guide for installing Front Row on the Mac Pro and just followed their "Case 2" by just manipulating the IOUSBFamily.kext . The last step was to copy the Front Row.app from System > Library > CoreServices to my Applications folder and adding it as a Login Item in the Preferences Pane: Accounts (you can use the one in CoreServices as well). Restart and chose a way to start Front Row, for example by using such a little script named openfrontrow.app (you find it on several websites, just google for the name). I got myself a copy of Wise Weasel’s Romeo Plugins 2.0 and used the Front Row Plugin for my Romeo. Now i can launch and control Front Row with my old Sony T610.